Haverford students speak of their experiences with religion, spirituality and religious life on campus. Last night with my host family. Left to right: Host Aunt, Host Uncle, Me, Host Brother, Host Mom, Host Cousin. They were delightful. This Summer, Haverford sponsored me to travel on a cultural exchange program in Central Asia! In a nutshell, the days consisted of working, co-teaching three or four English classes at various levels. My co-teacher was a local young man named Damir. It was important to him that all the classes be exciting and engaging for the students, so we constantly brainstormed new games and activities for practicing vocabulary and different types of discussion. Seeing the students so interested in class motivated me to keep working hard. In free time, I would hang out with the students or local teachers, going swimming or on long walks around the city and talking about anything. The most important part of the experience was getting to know my host family. There are many things about a culture—how people think and plan, how to make friendships, what causes honor vs. shame—that are best taught through relationships rather than learnt in any book. I'm grateful that they showed me patience as they taught me a little bit of what if means to live there. Likewise, one of the hardest parts of re-entry back to the States is that some of the most precious parts of the local culture—collectivism within the family and friendships, Russian language, the respect for elders regardless of achievement—my friends and family back here at home find less pertinent. As a person of faith, specifically a Christian, I believe God used the trip to teach me about what it means to have sincere community. Sometimes, because of the USA's highly individualistic culture, we forget the importance being together and serving one another. 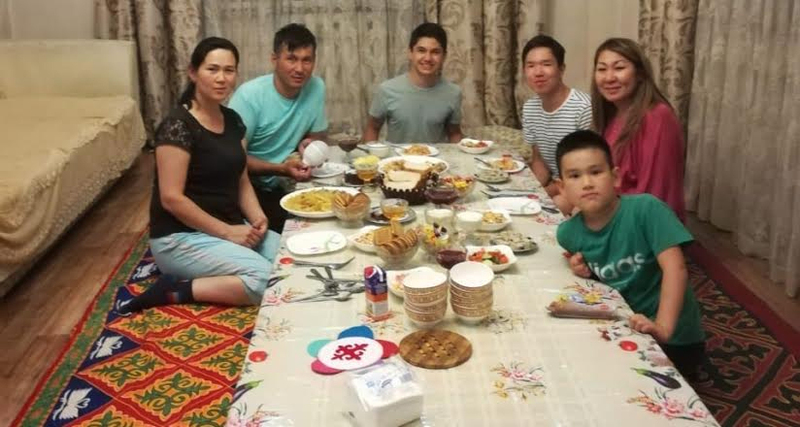 My host family in Central Asia goes to sleep and wakes up at the same time, shares their possessions more collectively than in the States, and share work together. This is something I want to work to establish in our fellowship at Haverford, albeit to a lesser extent. One more aspect of the trip I am thankful for, is that I had many opportunities to share about my faith in Jesus, when it came up in discussion because my local friends were curious. The month was a special journey where I could learn about life and as well give to others. Thank you very much to Haverford, specifically the Office of Religious Life for helping me to go on this adventure! Yasmine helped organize a dinner to celebrate Eid Al Adha, the Muslim 'Feast of the Sacrifice,' one of two major Muslim holy days observed around the world. 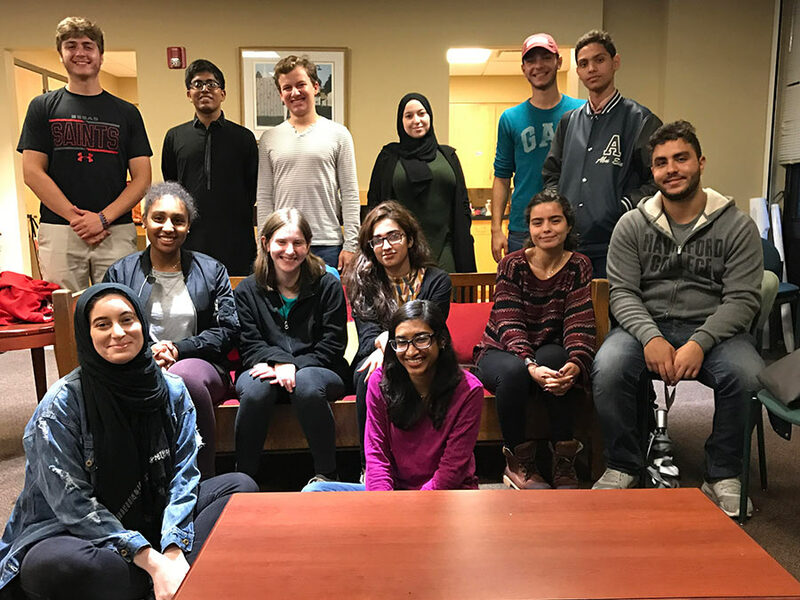 Thirteen students, both Muslim and non-Muslim, attended, including friends and family of Haverford students from Swarthmore and Temple University. Support for the dinner came from the Religious Life Fund and the Quaker Affairs Office. Over the 2016-17 winter break, we got funding from the Office of Religious and Spiritual Life and the OMA (Office of Multicultural Affairs) to go to a Christian conference in Kansas City called OneThing that included 20,000 people from around the world. Over the course of the four days of the conference, we were greatly encouraged by the messages shared and worship experiences. We heard messages that helped us grow stronger in our faith and learned through breakout sessions how to respond to social justice issues such as the Black Lives Matter and LGBTQ movements in light of our faith. We had a lot of fun exploring quaint and unique Kansas City in between the sessions, and also got a chance to explore the resources available at the International House of Prayer, such as the 24-hour prayer room. Our time there ended with a celebration of the New Years with our kind and lovely host Linda by eating apples and honey, a Jewish tradition. I was a guest on what was otherwise a Peace Players International Board of Trustees trip. “PeacePlayers International is a non-profit organization which uses the game of basketball to unite and educate children and their communities.” It was a weeklong, whirlwind visit featuring non-stop action on-the-court, historical and geo-political tours to offer some context to help understand our work and enjoyed several traditional Middle Eastern feasts along the way! 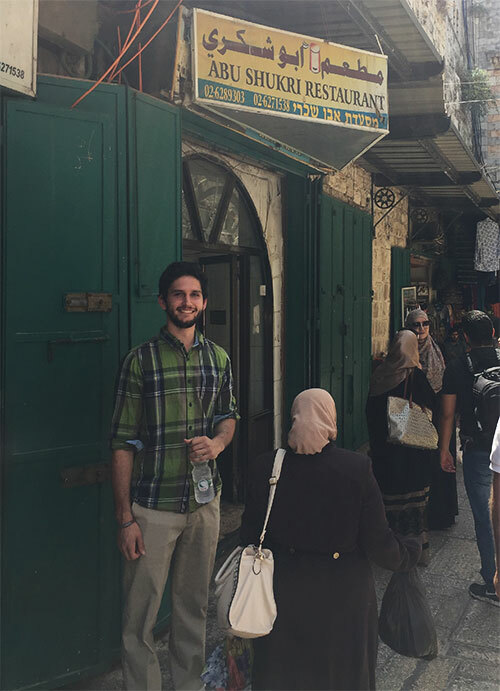 During the trip I developed an understanding of how simple and yet profound it is to bring these kids [Israeli and Palestinian] who are already kind, and full of joy and teach them how to share that with "other" who they have been raised to feel they have no business sharing anything with. It is simply a matter of taking people who feel they have no business being together, and giving them business to be together for (in this case, basketball) and watching relationships stem based out of one mutual bonding point of sport and being part of a team and thus codependent. The values that Haverford emphasizes and the students that make up the community create the perfect atmosphere to explore a wide variety of religious and spiritual perspectives in order to strengthen one's own grounding. Through my classes, friends, and on-campus involvements, I've really been allowed to explore myself and my Jewish roots through many lenses. I've learned about politics, spirituality and academia, and have found myself with a stronger and stronger Jewish identity. I've also been fortunate enough to have a role in Haverford's Jewish life, and the community that I've found there has helped me along my own journey. In Haverford Hillel, I can learn from and with others through services, conversations, meals, and friendships. The Haverford community lends itself to supporting religious life, religious identities, and meaningful discussions about all they involve. Without all these things, I would not be the Jew or the person I am now, and I wouldn't trade them for anything. Going to the Poconos last weekend was one of the highlights of my semester. Oftentimes during busy times of the semester, it is difficult to find space to slow down and appreciate the joy of simply being in community. The trip to the Poconos provided us with the opportunity to have the space and quiet to be with one another without distraction, and to reflect on life without being entangled by stress. Over the weekend, we took hikes through the woods, prepared meals together, sat by the fire and read, and talked about our lives and experiences at Haverford. I was so grateful for the opportunity to meet people I’d never spoken to before and have the opportunity to learn about them, as well as to reconnect with friends. Overall, it was a deeply grounding and wonderful experience. 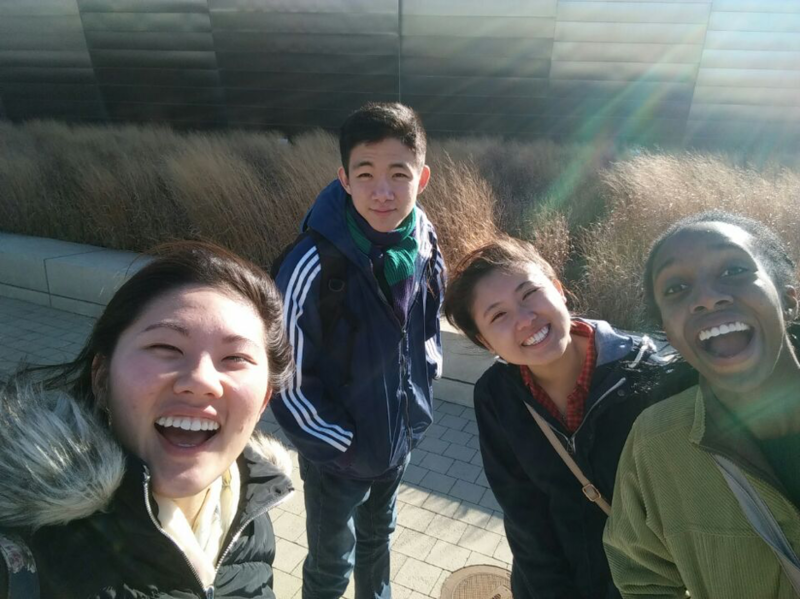 On the 4th of February 2017, 5 students form Haverford College funded by Haverford’s Office for Religious and Spiritual Life, attended Inter-Varsity USA’s Christian Fellowship’s Mid-Atlantic conference named Release. The conference saw the attendance of over 150 students all over the Mid- Atlantic region including Canada. The target group for the conference was students who identify as African, African-American, Afro-Caribbean and students who identify as black. Divided into three sessions, we had series of exhortations from Pastor Drew Jackson, who pastors at GraceWay Community Church in Bethlehem PA, small breakout sessions and amazing praise and worship. The main theme of the conference was about being released to do to work of the ministry and impacting our various campuses with the gospel of Jesus Christ. All in all, this conference was an amazing opportunity to get out, connect with young believers and be inspired to go out and preach the gospel boldly. On February 23rd, 9 members of the Haverford student community attended a talk by Reza Aslan at the University of Pennsylvania, funded by the Quaker Affairs Office and the Center for Peace and Global Citizenship. The talk was definitely enlightening and thought provoking. As an Iranian immigrant to the US, Mr. Aslan drew upon his experience to describe and explain the fluctuations in Islamophobia throughout the past few decades in the US. He also made parallels with the Historical experience of other Religious Groups, such as Catholics and Jews, in the past few centuries and commented on how the discrimination was not based on a lack of understanding but rather a basic human reaction-fear. I particularly found his insight on the current political situation interesting, with his reference to President Trump referring to Islam as a Political ideology over a religion. Thus implicating the delegitimisation of the religious rights and freedoms Muslims are granted under the Constitution. Aslan concluded his talk on a more optimistic note, acknowledging the fluid concept of the American identity and predicting that one day, Islam will also be part of the social fabric and identity of the United States. As soon as I came to Haverford, it was surprising to me that the religious life here was so open, coming from a high school where discussing religion was a no-no. It was very easy to immerse myself into some of the Christian groups.In the little time here I have grown tremendously because of the many groups. My experience with religious life on campus has been strong because my sect is so well represented and strong here. As a Quaker College I find a lot of strength in the other Quakers and the amazing leadership opportunities and classes to educate others about my religion. Essentially I feel privileged to have such a big community and presence of Quakers on Haverford's campus. Through the generosity of Office of Religious & Spiritual Life, we had the privilege of attending a Christian conference called "Jubilee" in the spring of 2015. This conference greatly helped each of us to grapple with concepts relating to faith and responsibility. We both came to Haverford with strong religious backgrounds, and we have experienced our faith being challenged and refined through dialogues with our peers and classroom learning. This conference was a time to continue to consider the big faith questions, but it also allowed us to gain specific skills to aid our personal religious journeys. We are thankful for the opportunity to attend this conference, and we look forward to sharing what we have learned with the Haverford community. My dad was born into a Greek Orthodox family (he has since adopted Buddhism) and my mother into a Lutheran household. Following in my mother's footsteps, I too was baptized in the ELCA Lutheran church. I was then confirmed in the Presbyterian Church USA and now participate in a Episcopal campus ministry. My broad religious background is one of the many reasons I am fascinated with interfaith dialogue and am dedicated to its continual occurrence on Haverford's campus. There is potential for great growth in terms of understanding, conversation, and action on the part of all students today, but especially on a campus as aware and diverse as Haverford's. While there is much still to be done in terms of religious awareness and dialogue, we are in the right place at the right time to make it happen.